Fitness gloves belong in every training bag, since the hands need to be perfectly protected for the training in the fitness centre. Furthermore, training gloves optimally contribute to the hygiene. 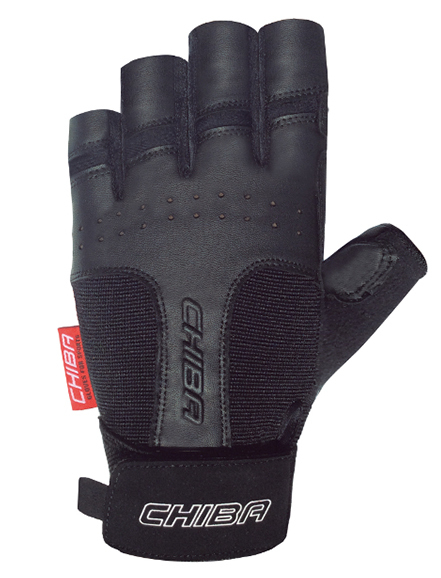 The Chiba fitness gloves Classic without fingers are perfect for any kind of exercise. They convince with outstanding grip and a material mix, which renders them very durable and breathable. These fitness gloves are suitable for women as well as for men. They are equipped with lifting hooks and perform by their elastic materials on the upper hand as well as palms made of Clarino leather. Furthermore, our fitness gloves Chiba Classic are anatomically shaped and offer highest comfort due to the gel padding of the palm. In addition, these ladies’ and men’s fitness gloves are very well ventilated and thus avoid a heat-related performance drop. Leather fitness gloves such as the Chiba fitness gloves Classic are not only particularly hard-wearing, but also do not restrict any movements without restricting them. The quick-pull pull-off aid make them very comfortable. With the terry thumb it is possible to wipe off the sweat while exercising. The manufacture of the seams as well as the fit of our fitness gloves Classic is outstanding. The gel pads and the good ventilation provide for special comfort. These elastic professional fitness gloves for optimum success of training as well as the perfect protection against blisters must not be missing in any sports bag. The fitness gloves Chiba Classic are easy to clean and washable at 30 degrees. Conclusion: Chiba fitness gloves Classic: The perfect gloves for particularly efficient exercises.